Jade Fisher is a greeting card and paper goods brand with a desire to spread a little joy. Our aim is to deliver luxury paper products that combine playful, pretty illustration with sweet, heartfelt sentiments for all people, for all occasions. As we are inspired by nature, we want to protect it! Our hand-painted designs are printed on 100% recycled papers, paired with a recycled envelope and a recyclable cellophane sleeve. We always use FSC certified papers. With an illustration degree, memories of Californian road trips and a true love of American folk art, Jade’s illustration career began with commissions and exhibitions of her folk tin paintings, which developed into the decorative, joyful style that now adorns our paper products. 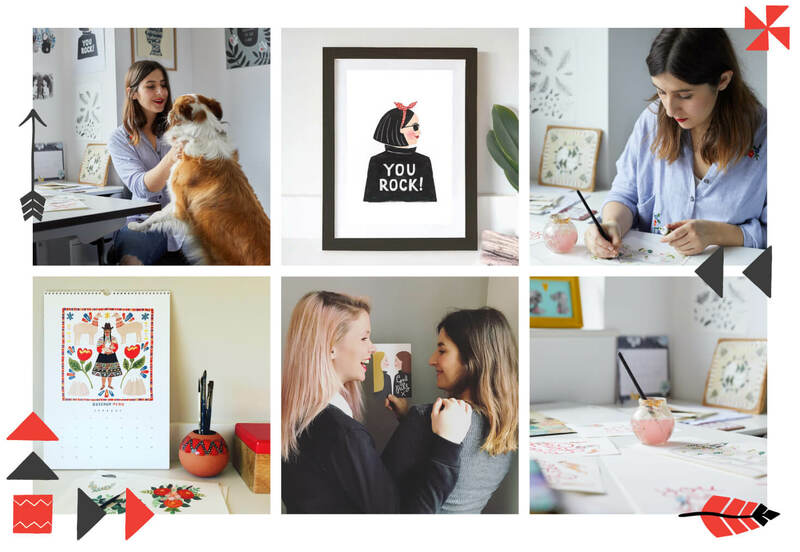 Jade launched the greeting card company in 2015, teaming up shortly afterwards with childhood best friend Lauren. Now based in our studio just outside Cardiff, Wales, Jade takes inspiration for new designs from outdoor adventures with her family & friends and a much loved gang of dogs.